General Samuel Cochran Phillips (February 19, 1921 – January 31, 1990) was a United States Air Force four-star general who served as Director of NASA's Apollo Manned Lunar Landing Program from 1964 to 1969, the seventh Director of the National Security Agency from 1972 to 1973, and as Commander, Air Force Systems Command (COMAFSC) from 1973 to 1975. Phillips was born in Springerville, Arizona, on February 19, 1921. He attended public schools in Cheyenne, Wyoming, graduating from Cheyenne High School in 1938. He earned a Bachelor of Science degree in electrical engineering from the University of Wyoming in 1942, and a Master of Science degree in electrical engineering from the University of Michigan in 1950. He was a member of the Kappa Sigma Fraternity. During his summer break in 1940, he earned his private pilot license. He was commissioned a Second Lieutenant of Infantry after completion of Reserve Officers Training Corps training and graduation from the University of Wyoming. He then entered active military service, transferred to the Army Air Corps, attended flying school and earned his pilot wings. During World War II, Phillips served as a combat pilot with the 364th Fighter Group of the Eighth Air Force, based in England. He completed two combat tours of duty in the European Theater of Operations. He was awarded the Distinguished Flying Cross with oak leaf clusters, Air Medal with seven oak leaf clusters, and the French Croix de Guerre. After the war, he was assigned to the European Theater headquarters in Frankfurt, Germany. Then, in July 1947, Phillips was transferred to Langley Air Force Base, Virginia. Phillips's research and development assignments included six years with the Engineering Division at Wright-Patterson Air Force Base, Ohio; duty as an electronics officer with the nuclear weapons experiments at Eniwetok Atoll during Operation Greenhouse; and in Project Officer assignments with the B-52 Stratofortress heavy bomber, the AIM-4 Falcon air-to-air missile, and the Bomarc surface-to-air missile programs. Phillips returned to England in 1956, where he served with the 7th Air Division of the Strategic Air Command. His participation in negotiating and completing the international agreement with the United Kingdom for the deployment and use of the American Thor nuclear-armed intermediate-range ballistic missile (IRBM). This latter assignment earned Phillips the Legion of Merit medal. Phillips returned to the United States in 1959, and he was assigned to the Air Force Ballistic Missile Division of the Air Research and Development Command, in Los Angeles, California, as the Director of the Minuteman Intercontinental Ballistic Missile Program (ICBM). In 1963, NASA Associate Administrator for Manned Space Flight George E. Mueller admired Phillips' skill in managing the Minuteman and other Air Force projects, and proposed bringing him to NASA on detached military duty as program controller of Manned Space Flight. Phillips' Air Force superior agreed, on the condition that Phillips be hired instead as Director of the Apollo manned lunar landing program. In December, this was accomplished and Phillips was assigned to NASA. By this time, he had achieved the rank of major (two-star) general. I'm at the level which knows all the things you have to know to make a major decision. Below the program director, there isn't anyone who has the whole picture. Above the program director, the men have so many other responsibilities. In November 1965, Phillips took a team to North American Aviation in Downey, California, prime contractor for the Command/Service Module and also the Saturn V launch vehicle's S-II second stage, to investigate problems of delays, quality shortfalls and cost overruns. On December 19, he wrote a memo to NAA president Lee Atwood with a copy of a report of his findings and some recommended fixes, which he also sent to Mueller. Mueller also sent Atwood a follow-on letter strongly expressing his disappointment with the CSM and S-II problems, requiring a response by the end of January 1966 and a follow-on visit of Phillips' team in March. When the Apollo 1 fire killed three astronauts in a ground test on January 27, 1967, just before what was to have been the first manned Apollo mission, a Congressional investigation uncovered the existence of what came to be known as "the Phillips Report". NASA Administrator James E. Webb was called before Congress and testified he was unaware of the existence of this report, which ignited some Congressmen's and Senators' criticism of NASA and the selection of North American as the contractor. However, with the political support of President Lyndon B. Johnson, this controversy blew over and over the next eighteen months, Apollo got back on track toward manned missions and the goal of a first lunar landing before 1970. 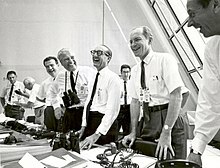 At a small dinner party before the launch of Apollo 10 in May 1969, Dr. Wernher von Braun, director of the Marshall Space Flight Center in Huntsville, Ala., praised General Phillips as the one most responsible for pulling the many pieces of the Apollo program together and making them work, on time. During the Apollo 11 mission in July 1969 which achieved the program's manned landing goal, Phillips announced his intention to leave NASA and return to Air Force duty. During his NASA service, he had been promoted to Lieutenant (three-star) general. In September 1969, Phillips was placed in command of the Space and Missile Systems Organization (SAMSO), of the Air Force Systems Command (AFSC) in Los Angeles. In August 1972, Phillips was appointed as the Director of the National Security Agency (DIRNSA) and also as the Chief of the Central Security Service. After two years in those positions, Phillips was assigned as the Commander of the Air Force Systems Command, in August 1973, at Andrews Air Force Base, Maryland. He retired from the Air Force in 1975 as a four-star General. He was a Fellow of the Institute of Electrical and Electronics Engineers (I.E.E.E. ), and as a member of the American Institute of Aeronautics and Astronautics. He was selected for a fellowship by that organization in October 1969 for "notable and valuable contributions to sciences and technology." In addition, Phillips was a fellow of the American Astronautical Society; an honorary member of the national business fraternity, Alpha Kappa Psi; a member of the Board of Governors of the "National Space Club"; a member of the Board of Directors of the United Services Automobile Association, and the president of the Military Benefit Association. Phillips was awarded the Air Force Distinguished Service Medal in September 1969 for his service with NASA, and once again in July 1972 for his service as the Commander of SAMSO. Phillips also was awarded two NASA Distinguished Service Medals by that agency, in 1968, and in 1969, for his distinguished contributions to the Apollo Program. Phillips held an honorary Doctor of Laws degree from the University of Wyoming. On September 26, 1971, Gen. Phillips was awarded the Smithsonian Institution's Langley Gold Medal in aviation and space exploration for his contributions to the Apollo Program from 1964 to 1969. He was the 14th recipient of the Langley Medal since the award was first presented to the Wright Brothers in 1909. In April 1971, Gen. Phillips was elected a member of the National Academy of Engineering for his leadership and his direction of the Minuteman missile Program and of the Apollo Program. Phillips received the General Thomas D. White U.S. Air Force Space Trophy on September 11, 1972, and also the Flying Tiger Pilot Trophy (awarded by the American Volunteer Group) on July 7, 1973. Phillips was married to Betty Anne Phillips; they had three daughters. He was initiated to the Scottish Rite Freemasonry till the 33rd and highest degree, becoming Past Master of all four of the Scottish Rite Bodies in Dallas and as active member of the Supreme Council with the office of Sovereign Grand Inspector General of Scottish Rite Masons in Texas.. He died of cancer in Palos Verdes, California, on January 31, 1990, aged 68. This article incorporates public domain material from the United States Government document "USAF biography". ^ a b Bieber, Dana. "The man who led America to the moon: Gen. Samuel Phillips helped nation compete in space race". Made in Wyoming. Lee Enterprises. Archived from the original on May 11, 2009. Retrieved October 11, 2016. ^ a b c Wilford, John (1969). We Reach the Moon; the New York Times Story of Man's Greatest Adventure. New York: Bantam Paperbacks. p. 228. ISBN 0-373-06369-0. ^ Garber, Steve (February 3, 2003). "NASA Apollo Mission Apollo-1 -- Phillips Report". NASA History Office. Archived from the original on October 31, 2004. Retrieved April 14, 2010. ^ a b Narvaez, Alfonso A. (February 1, 1990). "Samuel C. Phillips, Who Directed Apollo Lunar Landing, Dies at 68". The New York Times. Retrieved April 14, 2010. ^ "Biography of Samuel C. Philips". Sam P. Cochran Lodge #1335 (Grand Lodge of Texas, A.F.& A.M.). Archived from the original on Aug 31, 2018. Retrieved Nov 16, 2018.